Acute bronchitis (lasts between 1 to 3 weeks, but cough can remain for up to 3 months afterwards). It is usually triggered by the common cold. Chronic bronchitis (long lasting or recurring, and mostly occurs among smokers). I do not have any experience with chronic bronchitis, so it is not a part of this conversation. Slippery Elm Bark: Slippery Elm is a tree native to North America. It’s inner bark has been used both internally and externally for centuries by Native Americans to heal inflammations, wounds, sore throats and many other purposes – read more here . The inner bark is known for its soothing and emollient properties. You can buy it in many health stores or online. Take 1.5g 3 times per day with a glass of warm water. Make sure that you take it separately from any other medication since it may interfere with their absorption. Wild Cherry Bark: Wild Cherry is a tree native to North America. 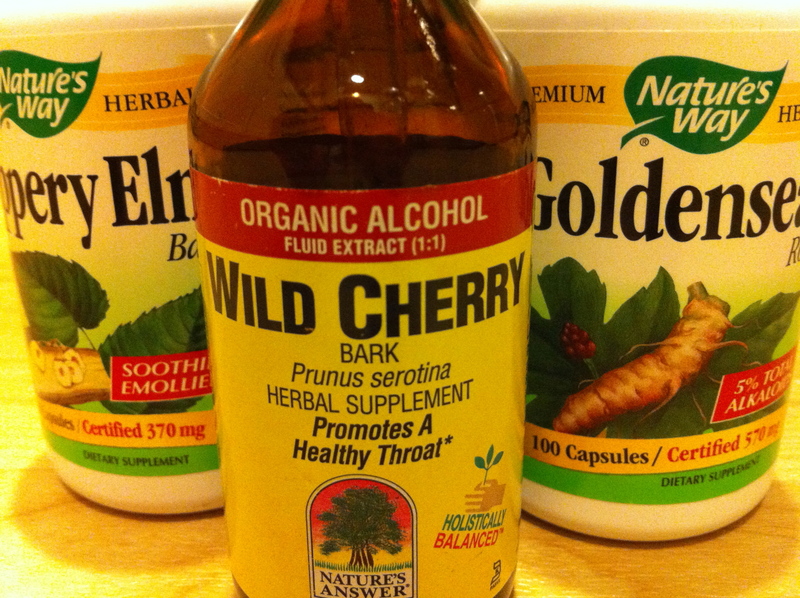 Wild Cherry bark relieves coughs and irritation of the respiratory tract through its soothing, antispasmodic, anti-inflammatory and expectorant actions – read more here. I had difficulties finding it in stores, but you can buy it online. Take 20 to 40 drops in a little water 2 to 5 times per day. Red Clover: Red clover is a wild herb that commonly grows wild in meadows throughout Europe and Asia, and has now been naturalized to grow in North America. Red clover contains phytoestrogens—compounds similar to the female hormone estrogen. Historically, red clover has been used for cancer and respiratory problems, such as whooping cough, asthma, and bronchitis – read more here. You can buy it online. Take 30 to 40 drops in a little water 3 times per day. Best taken between meals. While taking it drink plenty of water throughout the day. Caution: red clover may interact with other drugs – read more here. Goldenseal: Goldenseal is, actually, my saviour. I am using it for so many different things that I lost count: inflammations, infections of any kind (including UTI), respiratory tract infections, etc… Goldenseal contains the chemical berberine, which might have effects against bacteria and fungi. Berberine also has properties that can lower blood pressure and improve irregular heartbeats. In addition, early research suggests that berberine can lower blood sugar and “bad” low-density lipoprotein (LDL) cholesterol – read more here. You can buy it in many health stores or online. However, make sure that you are buying goldenseal root, not goldenseal herb: root is much more potent than herbs and contains 5% alkaloids instead of 1.5% for herb. Take 1g 3 times per day preferably with food. Umckaloabo – Umckaloabo contains an extract from the root of the South African Geranium. It is known for successful treatment of acute bronchitis, upper respiratory tract infections, the common cold, and tonsillopharyngitis. Known to stimulate the immune system, it also helps prevent the spread and growth of infection. For this reason, some people use the herbal remedy as an alternative to traditional antibiotics. Learn more about Umckaloabo research here. However, when I tried it after 2 dosages my stomach got upset, so I stopped using it. I could not find it in stores in US, but you can buy it online. I found references to some other supplements that may help to treat bronchitis, but I haven’t tried them myself: licorice root, turmeric, ginkgo leaf extract, ephedra, cinnamon. If you plan to try them out, please do research first since they may potentially interfere with other medicine. Last, but not least: take plenty of rest and drink a lot of fluids (my personal choices: chicken broth and green tea). This information is for educational purposes only and is not intended or implied to be a substitute for professional medical advice. Always seek the advice of your physician or other qualified medical provider for all medical problems prior to starting any new treatment.